An early morning tag - the Weeping Woman puts in another appearance. The background is metallic acrylic paint with white embossed swirls. I brayered the background for the lady's face - not that you'd ever know - but at least this bit of brayering didn't end up being discarded! Oh dear, I wonder why she's so sad. But beautiful. 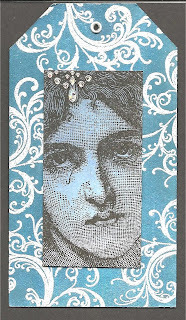 I love the metallic paint background with the white embossed swirls. You are the Queen of Tags, I must have a go! Beautiful tag loving the weeping woman - I've done a bit of that myself this week so had to come and have a proper look at it! Hope you're having a fab day! WOW this is a beautiful Tag! I love the image of the weeping woman! This is really lovely; very pensive! What a beautiful, soulful tag you have created. You have excelled yourself here! Hope you have a better week this week. Gorgeous tag, Penny! Love the swirls and the woman is perfect for your tag! It's wonderful to meet another artist! Hello and thank you for stopping by. Love, an air hug to you and beautiful days ahead. Lot of art and loads of loveeeeeeeeeeeee!!! The tear on the cheek is so beautiful.